The new project in the award-winning Theatre of War series depicts the initial (defensive) stage of the Kursk battle. 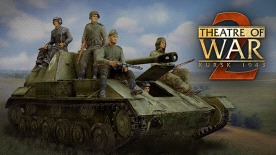 In Theatre of War 2: Kursk 1943, you control the units of the battle group belonging to German division Grossdeutschland or the forces of the Soviet 67th Guards Rifle Division and 3rd Mechanized Corps, which participated in the defensive stage of the Kursk battle at the south face of the Kursk salient. Each campaign consists of up to 9 engagements and puts you in charge of a typical military unit from that period. Each soldier and officer is a unique personality with characteristics and skills which can change during the campaign. Careful planning and troops selection is recommended before each engagement. Simulation-level visibility, ballistics and armor penetration systems. Tools for creating your own missions and maps (built-in Mission Generator, wizard-like Simple Editor, full-blown Mission Editor and 3D Map Editor).